Editor’s Note: This is the second in a series of posts analyzing engagement strategies on community-centric products through the lens of of Nir Eyal’s Hook Model. In the first post, Anuj Adhiya, founder of PlanitWide, talked about how Product Hunt applies the Hook model to drive retention within their community. Today, Anuj investigates the strategic and tactical patterns that emerge in GrowthHackers.com through the lens of that same model. SSshh – we quietly launched http://t.co/wZsXljvtN7 an hour ago. It’s early but would love your feedback. And with just one tweet, he launched the GrowthHackers community platform. GrowthHackers is a community where hacker-minded marketers come to share and learn from the best in the industry. Think of it as the Hacker News of viral growth marketing. Today, just 16 months later, the community is booming. The group doesn’t share exact membership numbers, but we know it’s growing. If we use GrowthHackers’ Twitter following as a guideline, it’s fair to assume that their membership is at least in the tens of thousands. We also know that over 65% of its monthly visitors are returning. Some of that membership was because Sean Ellis noticed a gap that needed filling and that he already had a following of his own. But that only addresses the question of why people came. Why they stayed (and continue to), is the more interesting question. This is why analyzing GrowthHackers from the perspective of the Hook model makes sense: we can see exactly what GrowthHackers has done to create a community of engaged professionals that has grown over time. 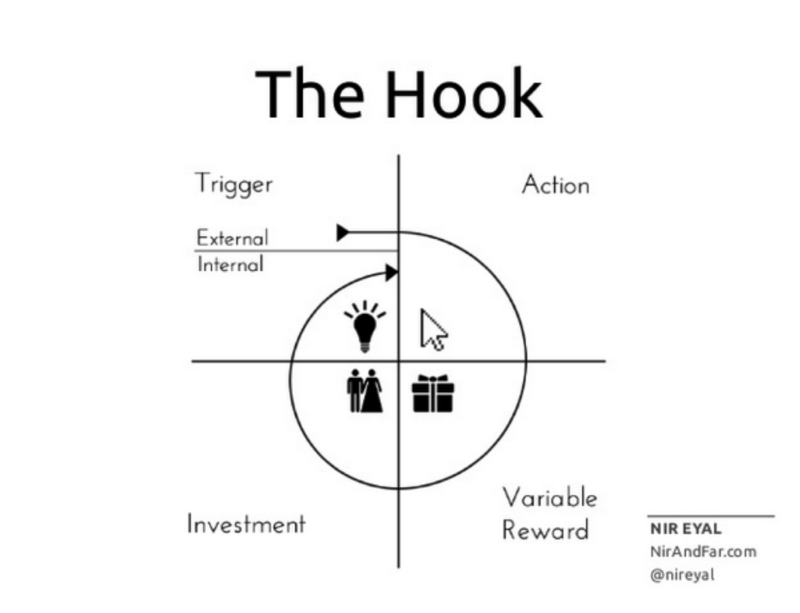 The basic idea of the Hook model is that should move your product’s users through a loop that – over time – will foster a habit of returning and contributing. You can read in-depth about the model in Nir Eyal’s book. It looks like this: A trigger, internal or external, drives a user to the platform where they get some sort of variable reward, contribute something of their own, and return to the platform later for the same loop. Let’s see how this loop works so well for GrowthHackers. GrowthHackers employs both internal and external triggers to get its users to think about returning every day. What are these triggers and how are they built into the community product? And this trend didn’t stop. In its first year, GrowthHackers reached over 100,000 monthly unique site visitors. The bottom line is that internal triggers are a critical technique for community experts to use. That is, find what people are already trying to do and just make it easier for them. Now in order to make sure that every time that internal trigger occurred, people would think of GrowthHackers.com, they’d first have to be brought in by external triggers several times. GrowthHackers employs 7 key product (external) triggers to remind people to come back again and again. These are the small prodding actions that get people to engage over time, cementing their bond with their fellow community members. Side note: The way GrowthHackers implemented external triggers has changed over time. The ones that have changed are called out below. This is a External Trigger 101. Knowing when someone commented on your post was critical to bringing members back to keep the discussion going. This is also a basic tactic. Pinging members when someone has furthered a conversation they were part of gets community members to engage more often. But the GrowthHackers team ran into a good problem with this trigger: the level of conversation was so high that this quickly led to email overload. Many people began asking for better control over email notifications. Think about it: users were saying that they didn’t need high levels of prodding to remember to come back! This is a good problem to have. Daily emails, which corresponded with in-app notifications, only if someone commented on a post you submitted, @mentioned you in a comment, replied to your comment(s) or upvoted your comment(s). Opt-in via user profiles for individual emails when someone commented on a post you’d commented on. Within a couple of months of launching, GrowthHackers sent out its first weekly email (also a highly requested feature). 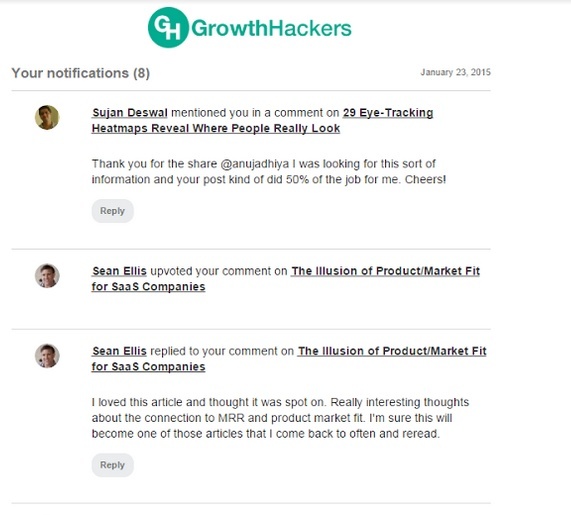 This email contains many posts that made it to the GrowthHackers Trending page that week. Next to the name of each post is the number of upvotes and comments it received. This serves as a visual reminder of popular conversations to check out and be a part of. Within weeks of launch, an early user, George Papadongonas, created a bookmarklet to make it easier to submit posts to GrowthHackers. The GrowthHackers team embraced this tool, even making it a permanent resident of the footer elements of the site. Because this widget is visible whenever you launch a browser, i.e., daily, you’d be reminded of GrowthHackers. The quality of discussions on GrowthHackers remains consistently high. It’s one of the main reasons people keep coming back. From the early days, discussions like this and this cropped up – and that hasn’t stopped. So for many users, there is a positive association with GrowthHackers of time well spent. This is a super powerful trigger as it allows you to be part of conversations with people like Sean Ellis and other founders. Where else are you going to get that opportunity on an ongoing basis? This is a natural by-product of discussions. You connect with new people, who could possibly help you with your work (and vice versa). Connections also happen with content authors when you share a lot of their content. They notice and appreciate the traffic (and discussions) that GrowthHackers provides. Knowing that there is a place where you can always make relevant connections starts out as an external trigger but fast becomes an internal one. 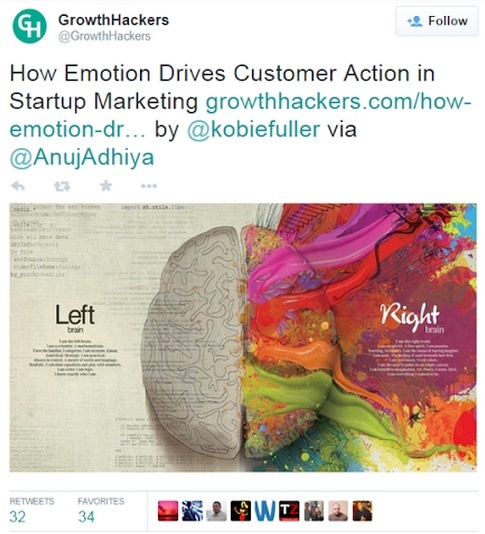 @GrowthHackers tweets out posts that make it to their trending page. Since a lot of the community follows them on twitter, this triggers a lot of users to return to the site. It also brings in new members. @QualarooInc (also run by Sean and his team) tweets out many of these same posts. Sean Ellis also tweets out these trending page posts regularly. All these tweets serve to increase the reach and visibility of these posts. Over and above these accounts, GrowthHackers also has niche Twitter accounts like @GrowthhackersSEO and @GrowthHackersSMB that tweet posts on GrowthHackers.com specific to SEO and small business. In the end, the cycle of internal and external triggers ingrains GrowthHackers as something to check out daily. As a result, the community comes together on a regular basis to engage around new discussions on high-quality submissions. The action is how a user responds to a trigger, like clicking a link or going directly to the site. GrowthHackers raises the odds that users will respond to the trigger by making it easy to act on these internal and external triggers. Many users are already motivated from within to check out what’s happening on GrowthHackers each day. But even the ones that aren’t as inclined to check out GrowthHackers daily are likely to be persuaded to check it out periodically. Let’s see how they remove barriers and encourage members to take action. Whenever there’s a comment to your post/comment or an @mention, the email helpfully contains the text of that comment and a Reply button that takes you straight back to that discussion on GrowthHackers. Super simple. There’s no need to remember to come back to GrowthHackers to see and take part in the conversation. This email does that work for you, making your next action (continuing the conversation) straightforward. 2. Bookmarklet: If you installed this widget, it removed the need to come back to GrowthHackers to submit a post. 3. Tweets: Multiple tweets through the day from all the GrowthHackers handles, Qualaroo and Sean contain the titles and links to the trending posts. This makes it easier to see what’s hot without being on the site and have an easy way to get back if the title is enticing enough. As the odds of users coming back to the site increase, the chances of them interacting with other members of the community go up as well. GrowthHackers hits all three variable reward types for creators. 1a. On the site, with upvotes & comments: When a submission hits the GrowthHackers trending page, the number of upvotes that post receives provides social validation. Given how the GrowthHackers ranking algorithm works, posts can be on the trending page for many days. This is especially true if the submissions result in a discussion. It’s this dynamic that keeps many members constantly on the look out for great posts to submit here. 1b. “Must Reads”: Submissions that are either of especially high-quality and/or those that resulted in a vibrant discussion make it to this section of GrowthHackers. The ones that make it here are carefully curated by the GrowthHackers team. There are no guidelines posted on what bar needs to be met for them to show up here. In other words, the most prized reward on GrowthHackers is also the most variable. 1c. On Twitter by the GrowthHackers team: As mentioned earlier, the @GrowthHackers, @QualrooInc & @SeanEllis Twitter handles tweet out posts that make it to the trending page. Their niche twitter accounts like @GrowthhackersSEO and @GrowthHackersSMB also tweet out relevant posts. This provides even more validation (and re-validation as the tweet gets retweeted and favorited). Additionally, people coming back to the site to read the post may upvote and/or comment on it. This raises the odds of even more onsite validation. Side note: When GrowthHackers first started tweeting trending posts, they’d include a hat tip to the submitter in it. This, of course, led to retweets and favorites and made their members feel valuable, which led to more validation. 1d. On Twitter, by other GrowthHackers users: Under each post is a button to tweet that post. Users who find the post and/or its associated discussion interesting have an easy way to share this. This provides another layer of peer approval. 1e. By email: Remember that weekly email with some of the top trending posts of the week? 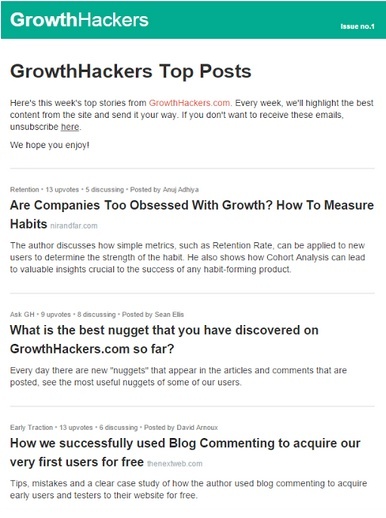 The posts that show up in this email are manually curated by the GrowthHackers team. These posts represent the most valuable posts and discussions of the week. Right next to the titles of the top posts are the names of the users that submitted them along with the number of votes and comments that post got. 2a. Built-in variability: You have no idea what’s going to show up on GrowthHackers every day. This is true as a creator or a consumer. It’s especially variable as a creator because there is no guarantee when or if the post you submitted will even show up on the trending page. This variability is core to the site’s functionality. By design, a list of posts with attention grabbing headlines combined with a helpful summary makes users want to read down the list to see what else is new today. 2b. Manufactured curiosity: At the bottom of the Trending, Latest, Must Read and Discussions pages, the “More Posts (or More Comments)” feature also plays into this curiosity to see what’s been submitted/discussed beyond what users can see immediately. 2c. “Must Reads”: As mentioned earlier, posts that show up in this section of the site do so at random intervals. This is because the GrowthHackers team decides which posts have met the bar for this. This gives users, and especially new users, a quick way to experience the best of GrowthHackers, beyond what shows up on the Trending page. .
3a. Trending Posts: Anyone can submit a post to GrowthHackers but few make it to the Trending page. Having a submission show up here is a signal from the community that they found a user’s contribution valuable. The more votes and (positive comments) a post gets, the better the user feels. Of course, nothing feels better than having the top trending post of the day. The most brilliant part about this, is that you get no notification (via email or in app) of when your submission gets an upvote (or who upvoted it). This is the definition of a variable reward. It means you’ve got to keep coming back to see if your post made it to the trending page or not. 3b. Comments: More often than not, starting or adding to a discussion with a unique observation or insight is as or more valuable than submitting a great post. The impact of this is potentially two-fold. Either other users (including well established names) upvote the comment itself and/or will respond to continue the discussion. Either way this is important validation that goes a long way towards a reputation of thought leadership. 3c. “Must Reads”: The Must Read section is as close to a leaderboard as you can get on GrowthHackers today. Having your posts show up here means that you added exceptional value to the community. Seeing more posts show up here just compounds how good a user feels. GrowthHackers’ mechanics are set up to make users do a bit of work that will set them up to continually to engage with the community. Let’s look at this from the perspective of consumers and creators. For more engaged users, the ability to upvote this stream of submissions and/or comments keeps them engaged onsite that much more. Consumers can also share posts that they like directly from the site. This in turn drives more people through the Hook loop. Once users are logged off, whether it’s a tweet, the desire to read and learn from more high quality discussions, or the weekly email, this prompts them to go through all the stages of the Hook Model all over again. These are the users that constantly submit new posts to GrowthHackers (I’m one of them!) and regularly comment on interesting posts. You can be sure that there’s a subset of users submitting posts (almost) every day. If even one of those posts gets featured on the Trending page, that encourages them to find more great content to submit because of all the validation they receive. The same dynamic applies to commenting. The more you comment, the greater the likelihood of getting a response. As the stored value goes up, it proportionally increases the importance of GrowthHackers as the user continues to engage with it. In this way, all the creator investments prime those users to go through all the stages of the Hook Model all over again. In the end, both consumers and creators investments serve the ultimate goal of GrowthHackers of “Unlocking Growth. Together”. It’s another great example of cooperative design. Since creators are also consumers, they experience that journey as well. So GrowthHacker’s ability to keep its users engaged is another great example of the Hook Model in action. Its design raises the odds of becoming a community that is also a daily habit, whether you’re a content consumer or creator. 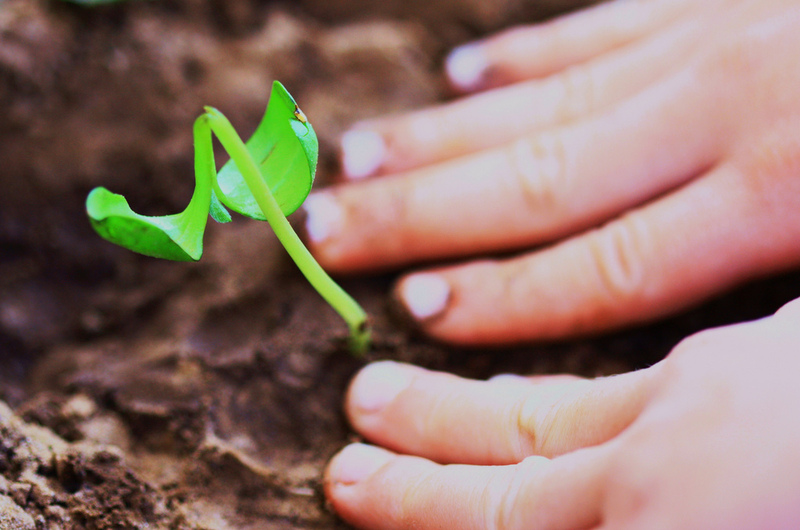 What lessons did you take away from GrowthHackers’ use of the Hook Model? Or are you doing something that’s working that they aren’t? Join the conversation in the CMX Hub Facebook group.